Acupressure, an alternative therapy based on Chinese acupuncture, is gaining cred: It’s now practiced at hospitals around the United States. 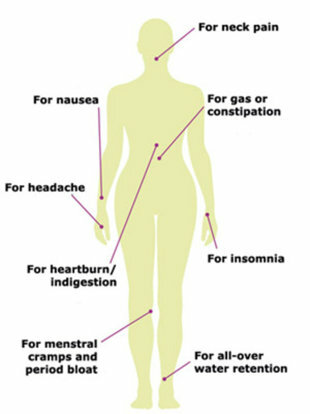 Use this pressure points chart to guide you through your pain, naturally. For headache: Pinch the web of flesh between your thumb and forefinger. For heartburn/indigestion: Press down in the middle of your torso, about six finger widths above your belly button and two below the bottom of your rib cage. For menstrual cramps and period bloat: Press on the inside of your leg, just below and slightly behind the knee joint. For neck pain: With your thumbs, press the hollows at the back base of your skull. For gas or constipation: Rub your abdomen clockwise, 150 to 300 times. For insomnia: Press down on the crease between the palm and wrist, in line with the pinky finger–daily, for best results. For all-over water retention: Press on the inside of your leg, about a hand’s width up from the ankle bone, just behind the tibia.